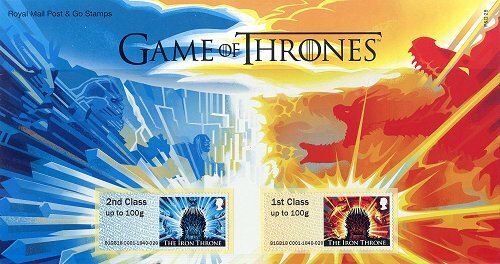 In a clear effort to capture the attention and interest of collectors and, in general, of the millions of fans of the series around the world, Royal Mail kicked off 2018 with a special philatelic edition dedicated to the 'Game of Thrones'. Whilst 'Game of Thrones' is an American television series, most of the filming takes place in studios and locations in the United Kingdom and Northern Ireland and the cast is mainly composed of British actors. The special edition issued on January 23rd 2018, includes a set of ten stamps and a collectors sheet with five stamps dedicated to the characters and motifs of the series, as well as stamp booklets, postcards, covers, presentation packs and other associated products. 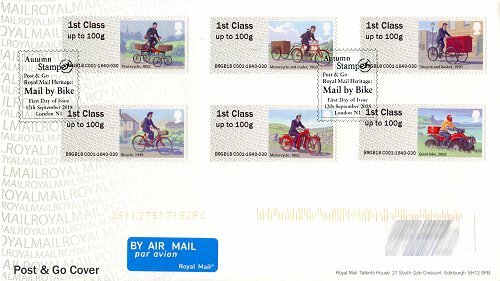 In addition, for the first time, Royal Mail produced a set of two 'Post & Go' designs dedicated to the same theme. Both designs show the 'Iron Throne', the throne of the King of the Seven Kingdoms forged with the swords of vanquished enemies. 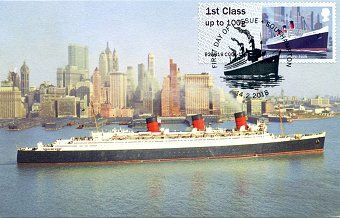 It is also the theme of a self-adhesive 'traditional' stamp (upper cover) and one of the special pictorial first day postmarks (right). 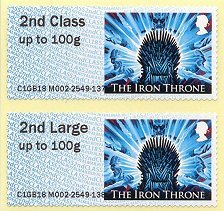 The labels with a blue background, dedicated to the theme of ice and with images of Night King, are used for the printing of '2nd Class' mail stamps, as denoted in the continuous text of the background printing. The labels with a yellow background, dedicated to the theme of fire and illustrated with dragons, will be used for priority mail'1st Class' stamps. 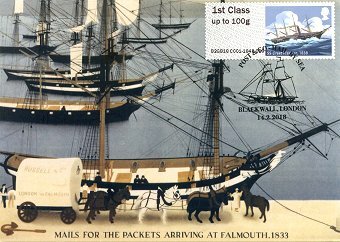 Royal Mail produced a pictorial information card with two stamps with the basic values ​​of domestic economy and priority mail (2nd Class & 1st Class up to 100g, respectively), printed on the back office equipment C001. Both stamps have the same lower identifier code, B1GB18 C001-1840-028. It is the 28th series, since the beginning of the 'Post & Go' issues. Starting from January 23rd and for a month, the two 'Post & Go - Game of Thrones' designs were available from the Intelligent AR kiosks installed in the Royal Mail Enquiry Offices (with machine codes beginning with the letter 'M') and at the London Postal Museum (with the museum's permanent identifier), as well as from many NCR - SSK postal kiosks installed in post offices across the country. 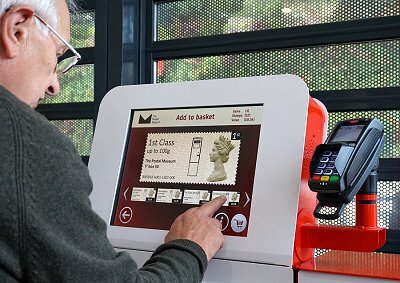 On the date of issue, the Intelligent AR kiosks installed in the United Kingdom were issuing stamps with eight different face value indicators, grouped into two Collectors Strips, one with two stamps for economy mail (2nd Class), and another with six stamps for priority mail (1st Class). 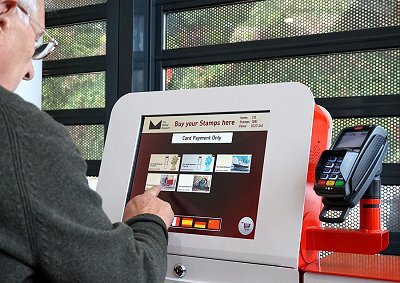 In addition to the eight basic face value indicators, the users of the NCR-SSK postal kiosks can also obtain the so-called 'open value stamps', variable value stamps for immediate use. These stamps include specific information about the shipment type (2L or 1L in the images), as well as the destination and weight of the postal item, and the postage tariff paid (see article, also published in VARIABLE 34). 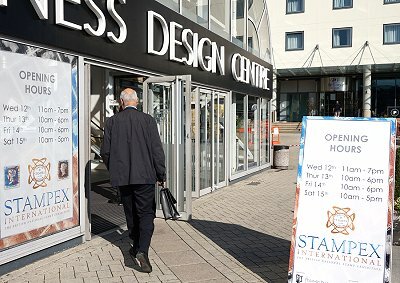 In 2018, the spring fair of the new "Stampex International", the new name for this major philatelic event, was held from Wednesday February 14th to Saturday 17th, at the Business Design Centre in Islington, London. The fair once again brought together more than a hundred international philatelic dealers, auction houses, specialist publishers and an ever decreasing number of philatelic services. These were distributed over the two levels of the central exhibition hall and the gallery bays, upstairs. 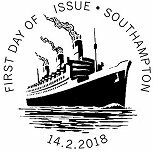 As usual in recent years, at the back of the large exhibition hall, the organizers had arranged the national philatelic exhibition organized by The Association of British Philatelic Societies (ABPS), and the Royal Mail stand. 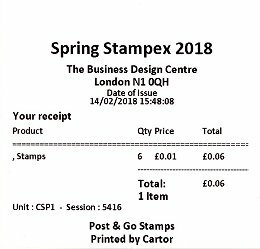 In 2018, Royal Mail decided to significantly reduce its presence at the Spring Stampex, by way of a small stand selling philatelic products, with no postmarking counter and, (as far as our field of study is concerned), without the usual 'Post & Go' zone. 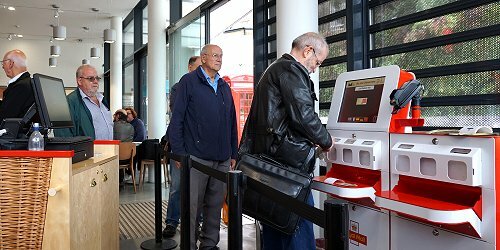 Indeed, for the first time since the London 2010 Festival of Stamps, when Royal Mail installed the first 'Post & Go' kiosk at a philatelic fair, Royal Mail decided not to install any philatelic kiosk at this year's event. 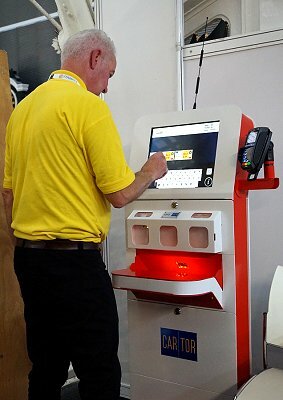 However, the Guernsey and Jersey philatelic services, and Royal Gibraltar Post Office, decided to continue participating in the fair, and installed its three philatelic kiosks on a stand at the end of the gallery bays on the second level, next to the zone dedicated to the promotion of youth philately. 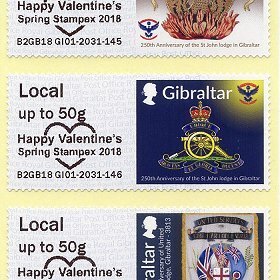 In the images, from left to right, the GI01 kiosk of Royal Gibraltar Post Office, JE01 of Jersey Post, and GG01 of Guernsey Post. 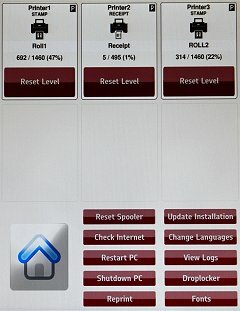 The software of these kiosks was updated with a new maintenance menu, with new options that improve the control of the equipment and management of the reels. 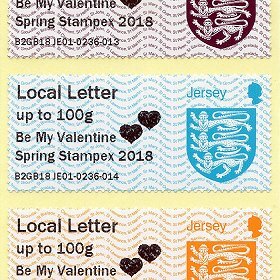 The opening of the Spring Stampex 2018, on February 14th, coincided with the celebration of Valentine's Day, so the three postal administrations decided to include a commemorative text on the stamps issued by its kiosks. going through a graphic design in the shape of a heart and the new 'Year of the Dog' design on the other roll, with no special imprint. These issues are dealt with in more detail in the article dedicated to Royal Gibraltar Post Office. and a graphic design with two hearts and the new 'Visiting Naval Vessels' thematic series, with no special imprint, on the other. These issues are dealt with in more detail in the article dedicated to Jersey Post. inside a graphic in the shape of hearts and the new 'Guernsey Bailiwick Flowers' thematic series, with no special imprint, on the other. These issues are dealt with in more detail in the article dedicated to Guernsey Post. 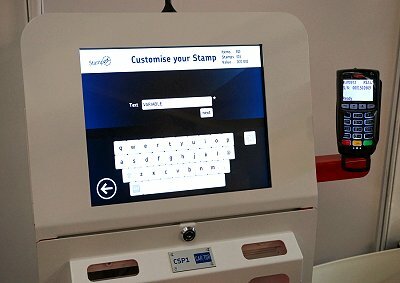 The first block of the code at the bottom of all the stamps issued by the three 'Post & Go' philatelic kiosks installed at Spring Stampex 2018, is B2GB18, followed by the machine code, then the transaction number and finally the stamp number. As usual, in addition to these machines, Guernsey and Jersey Post philatelic services sold Collectors Strips printed on the back office equipment B002. 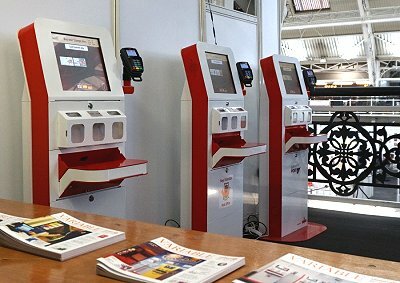 Although for financial reasons Royal Mail did not install any philatelic kiosk at Spring Stampex 2018, they decided to continue with the production of the 'Post & Go' thematic series and, in fact, the launching of the next series was again scheduled to coincide with the opening of the philatelic fair. After the series 'Royal Mail Heritage: Transport' (see article and VARIABLE 40), 'Royal Mail Heritage: Mail by Rail' (article and VARIABLE 44), and 'Royal Mail Heritage: Mail by Air' (article and VARIABLE 46), the fourth thematic series, showing the evolution of mail transport systems throughout the centuries, is dedicated to mail by ship. 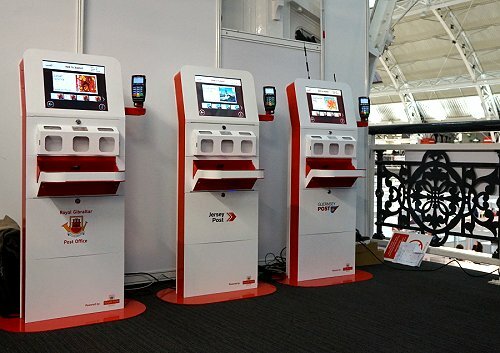 As on previous occasions, on the date of issue, the new series could be obtained at many of the NCR / SSK postal kiosks installed in post offices, from the IAR series 'M' kiosks installed in the Royal Mail Enquiry Offices, and from the A001 kiosk installed in The London Postal Museum (see next section). 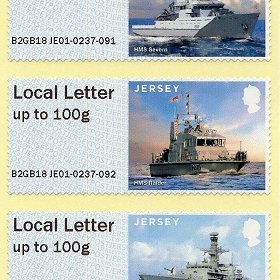 Royal Mail released the usual information card or presentation pack with the six designs (right image) printed with the back office equipment (C001) code. 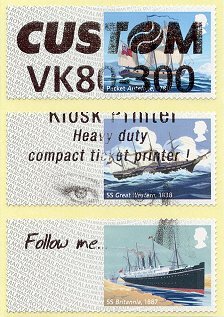 All the stamps have the same face value '1st Class up to 100g', and the same lower identification code. In this case, B2GB18 C001-1840-029, as it is the 29th series, since the beginning of the 'Post & Go' issues. increasingly being transported by plane. 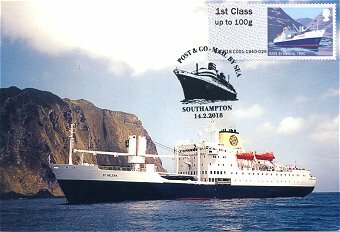 RMS St Helena was the last cargo ship that Royal Mail used for regular mail delivery. The rolls of labels were manufactured by International Security Printers, and have identical characteristics to previous issues. The illustrations are by Andrew Davidson. This series could also be obtained from the NCR - SSK kiosks with the 'open value stamps' format. The six 'open value stamps' below correspond to the six face value indicators programmed in the set or 'Collectors Strip'. Right, a test imprint produced by the NCR postal kiosks. 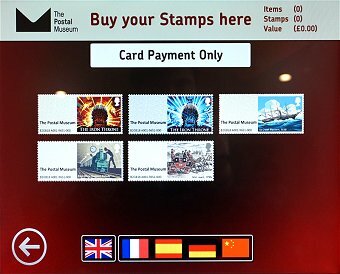 The new thematic series was also available, from February 14th 2018, from the A001 'Post & Go+' kiosk at the London Postal Museum. The stamps issued by this machine include the permanent identifier 'The Postal Museum'. 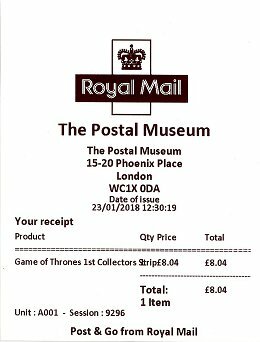 As can be seen in the screen image below, on that date, the philatelic kiosk was still printing stamps with the two designs of the 'Game of Thrones' series (see previous article), in addition to 'Post Office (London) Railway' and 'Mail coach' designs. 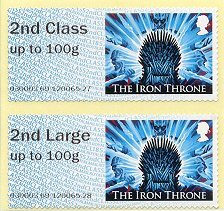 The new thematic series could only be purchased with the first value / rate of domestic mail programmed into the kiosks, '1st Class up to 100g'. 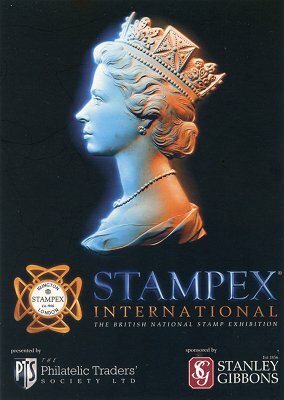 Stamp Active is an organization formed by volunteers, dedicated to the promotion of stamp collecting for young people in the UK. 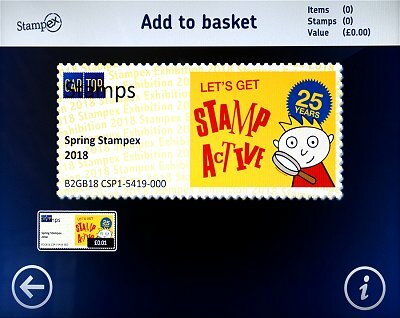 Among its different initiatives, Stamp Active organizes the 'Kids Corner', an area at the two annual London Stampex fairs where young people can discover the world of philately through different activities. 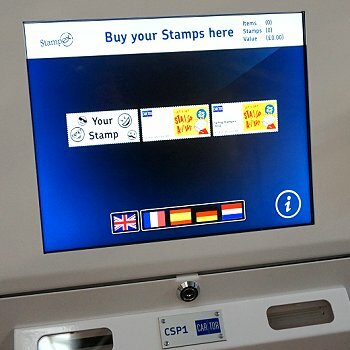 During Spring Stampex 2018, Cartor Security Printing decided to collaborate with this organization by installing its CSP1 test kiosk, using rolls of special self-adhesive cinderella labels illustrated with a motif dedicated to Stamp Active. ... or the user could customize the text printed on the labels, even adding an emoji (images below). 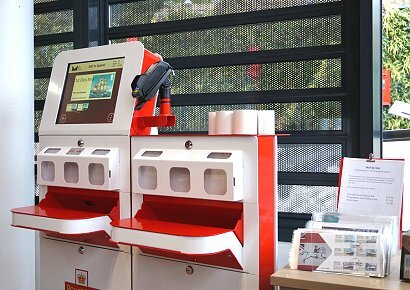 Children and young people had free access to the kiosk, while interested adults had to pay GBP 10 for a strip of cinderellas; a donation to finance the group's promotional activities. Like the sample labels manufactured for the CICE 2017 exhibition in Nanjing (see article, also published in VARIABLE 46), the Stamp Active labels are not produced on the usual yellow silicone coated backing paper but on a transparent release liner (film), which looks very attractive. The use of this type of thinner backing paper enables the manufacture of rolls with a larger number of labels in the same volume. 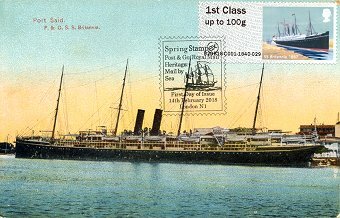 On February 16th 1941, the British steam merchant ship SS Gairsoppa was torpedoed and sunk by a German U-boat off the coast of Ireland. The wreck site was located in 2011 and its cargo was recovered in 2013. The new 'Voices from the Deep' temporary exhibition at the brand new London Postal Museum displays a selection of over 700 personal letters and other objects carried by the ship, and perfectly preserved at the bottom of the Atlantic Ocean for over 70 years in an airlock formed within the steam boat. 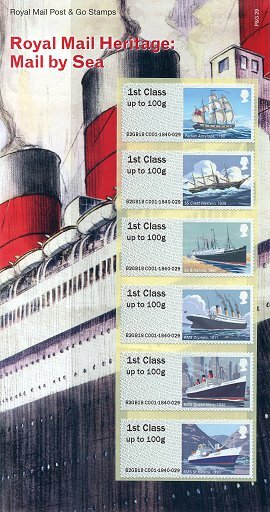 This printing will be available until the beginning of September, and only on stamps issued with the 'Royal Mail Heritage: Mail by Sea' series and available only with the first rate of domestic mail, '1st Class up to 100g'. On one of the strips of stamps issued with this special imprint we have discovered this curious error. 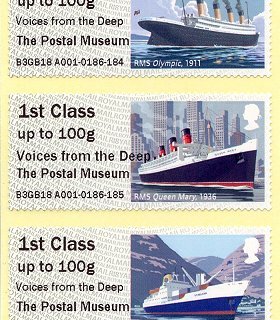 Because of a software glitch, the smaller font configured for the printing of the first line of text, 'Voices from the Deep', was replaced, in only one of the six stamps, by the default font used in the second line of the imprint. 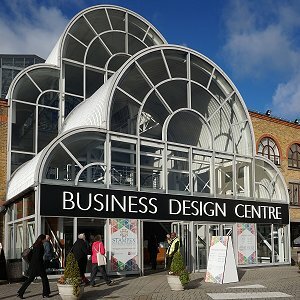 Autumn 2018 Stampex International was held from Wednesday September 12th to Saturday 15th in the great central hall of the Business Design Centre in Islington, north London. Accurately reflecting the current situation of philately today, this event attracts fewer and fewer visitors and dealers. 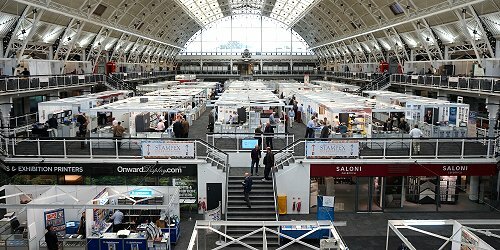 The autumn show brought together just over 80 international philatelic dealers, auction houses and specialist publishers, set out across the two levels of the central exhibition hall and the upstairs gallery bays. The high cost of stands and reduced sales have put off some dealers and many philatelic services in recent years and, in fact, only two postal administrations attended this fair. At the back of the large exhibition hall, the organizers had arranged the philatelic exhibition organized by The Association of British Philatelic Societies (ABPS), and Royal Mail's stand. 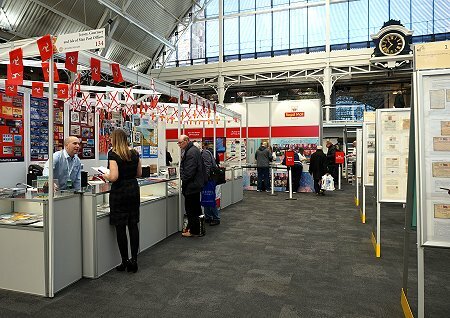 As in Spring Stampex, Royal Mail just set up a small stand selling philatelic products, and although they issued a new 'Post & Go' thematic series coinciding with the opening of the fair, they did not install any philatelic kiosk to issue it. 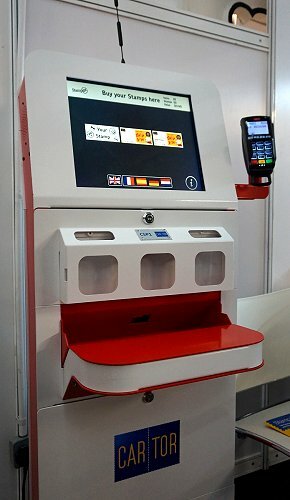 On the other hand, the Guernsey and Jersey philatelic services, and the Gibraltar postal administration, The Royal Gibraltar Post Office, decided to continue participating and installed their three philatelic kiosks on a stand at the end of the gallery bays on the second level, next to the zone dedicated to the promotion of youth philately. 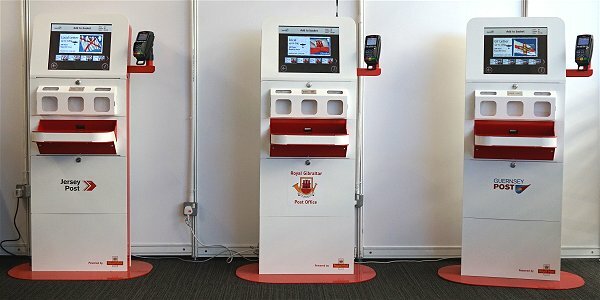 In the images, from left to right, the JE01 kiosk of Jersey Post, GI01 of The Royal Gibraltar Post Office, and GG01 of Guernsey Post. 2018 marks the 100th anniversary of the creation of the Royal Air Force of the British Armed Forces. Formed on April 1st 1918, during the First World War, it is the oldest independent air force in the world. 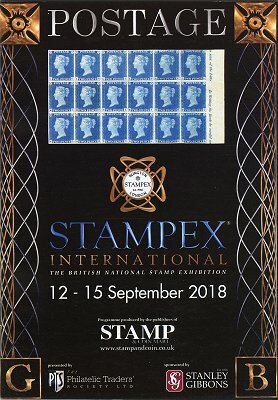 During 2018, in addition to many other countries members of the Commonwealth, the philatelic services of the three postal administrations issued sets of 'traditional' stamps dedicated to commemorate this anniversary, and during Autumn Stampex 2018 they decided to release a joint issue, with the same special imprint on the stamps issued with their respective definitive designs. along with a graphic featuring a Spitfire, a fighter aircraft used by the RAF during World War II, in addition to the new thematic 'Nautical knots' series but with no special imprint, from the other reel. 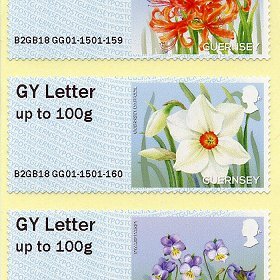 with the graphic featuring the Spitfire from one of the reels, and the 'Guernsey Bailiwick Flowers' thematic series (first issued during Spring Stampex 2018), with no special imprint, from the other. 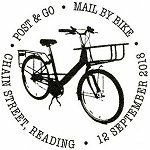 The first block of the code at the bottom of all the stamps issued by the three 'Post & Go' philatelic kiosks installed at Autumn Stampex 2018, is B9GB18, followed by the machine code, then the transaction number and finally the stamp number. As usual, in addition to these machines, Guernsey and Jersey Post philatelic services sold 'Collectors Strips' printed from its back office equipment. 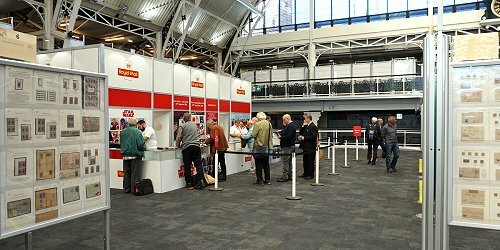 As previously at Spring Stampex, Royal Mail did not install any philatelic kiosk at Autumn Stampex 2018, although the release of what might probably be the last 'Post & Go' series was again scheduled to coincide with the opening of this philatelic fair. After the series 'Royal Mail Heritage: Transport' (see article and VARIABLE 40), 'Royal Mail Heritage: Mail by Rail' (article and VARIABLE 44), 'Royal Mail Heritage: Mail by Air' (article and VARIABLE 46), and 'Royal Mail Heritage: Mail by Sea' (article and VARIABLE 48), the fifth and last thematic series, showing the evolution of mail transport systems throughout the centuries, is dedicated to mail by bike. 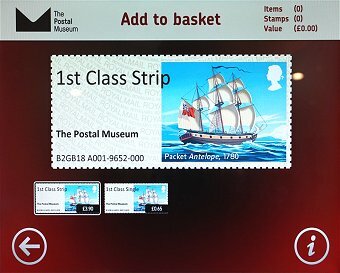 On the date of issue, the new series could be obtained at many of the NCR / SSK postal kiosks installed in post offices and from the A001 kiosk installed in The London Postal Museum (see next section). For the first time, the series was not available from the IAR series 'M' kiosks installed in the Royal Mail Enquiry Offices. 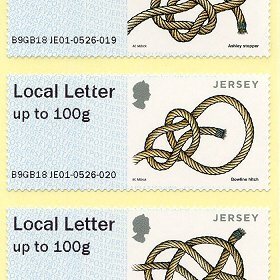 Royal Mail released the usual presentation pack with the six designs (right image) printed with the back office equipment (C001) code. 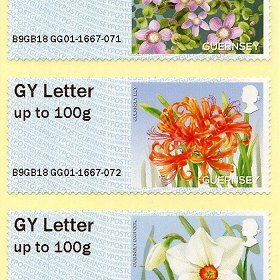 All the stamps have the same face value '1st Class up to 100g', and the same lower identification code. In this case, B9GB18 C001-1840-030, as it is the 30th series, since the beginning of the 'Post & Go' issues. 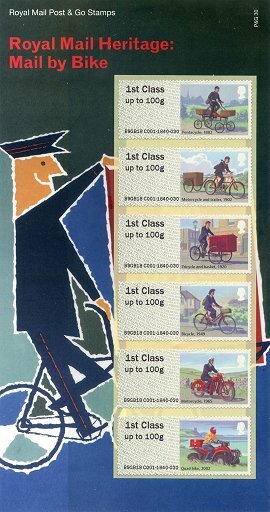 The 'Royal Mail Heritage: Mail by Bike' series is illustrated with images of six bicycles and motorcycles used to transport mail throughout history. 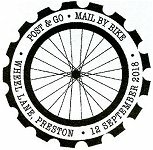 Since 1880, Royal Mail has experimented with different types of two, three, four and five wheel bicycles. At the beginning of the 20th century, they tested the first motorcycles, which were used regularly in the second half of the century for the transport and delivery of priority and urgent mail. 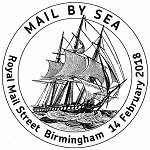 Royal Mail made available several pictorial first day postmarks to collectors . 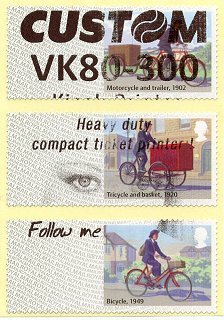 Like the previous series, some of the postmarks include geographical locations related to the series, such as 'Chain street', in Reading, or 'Wheel lane', in Preston. 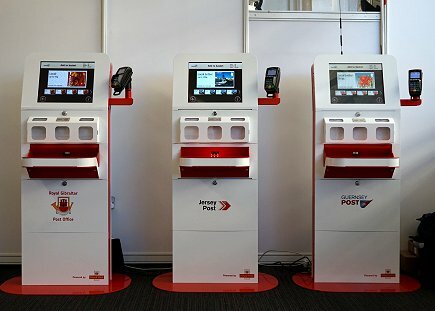 NCR / SSK postal kiosks. The central strip shows the set or 'Collectors Strip' with the six usual collectors values. The 'open value stamps' at the right correspond to the six face value indicators programmed in the set. Right, an NCR test imprint. 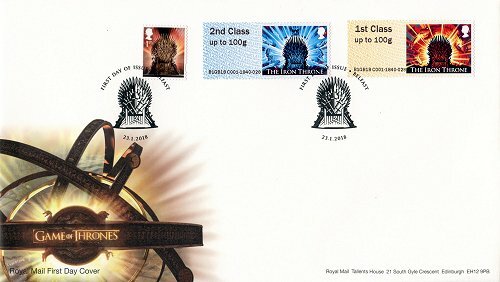 After the 'Machin Anniversary' and 'Game of Thrones' series, the 'Machin 1st Class' definitive design was finally installed on Monday July 2nd 2018, in the A001 'Post & Go +' kiosk of the London Postal Museum. 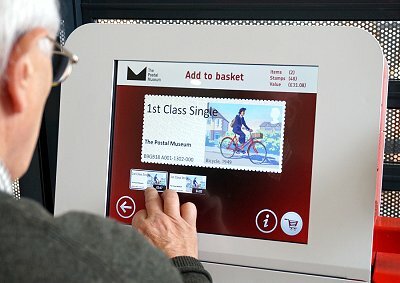 Although the blue 'Machin 2nd Class' design had already been in use since September 2017, the 'Machin 1st Class' design had not yet been available in this machine with ' The Postal Museum ' permanent identifier. 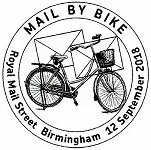 Coinciding with the opening of Autumn Stampex 2018, the new 'Royal Mail Heritage: Mail by Bike' thematic series was also available, from September 12th 2018, from the A001 'Post & Go +' kiosk at the London Postal Museum. All the stamps issued by the kiosk include the permanent identifier ' The Postal Museum ' and, as on previous occasions, the series could only be purchased with the first value / rate of domestic mail programmed, '1st Class up to 100g'. The museum produced special presentation packs and first day covers for this series. The museum also took advantage of the presence of many collectors in London to program a new special temporary imprint in its kiosk, commemorating the 50th anniversary of the type 'F' mailbox. In 1968, Royal Mail experimented with rectangular boxes of sheet steel, known as type 'F'. These proved not to be very hard wearing, so a new cast iron version, the type 'G', was introduced. 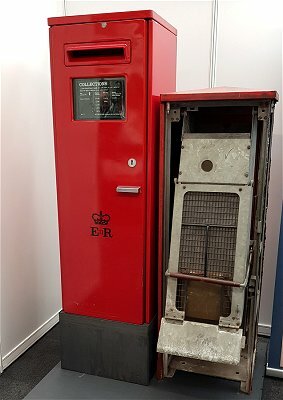 As a complement to this special issue, the postal museum exhibited the type 'F' letter box on its stand at Autumn Stampex 2018. 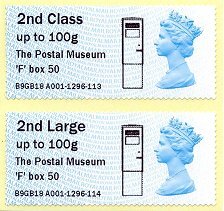 From September 12th to November 2018, all the stamps issued with the 'Machin 1st Class' and 'Machin 2nd Class' definitive designs included the special ' The Postal Museum 'F' box 50 ' imprint, next to a graphic featuring the letter box . At the end of October 2018, a programming malfunction occurred during the changeover to the 'Common Poppy' design. For a short time this caused the stamps with the 'Machin 1st Class' design with the normal configuration of the permanent identifier ' The Postal Museum ' moved to the bottom line, to be issued again but this time with the addition of the 'F' box 50 graphic (right strip). There are also stamps of different designs with the special imprint line slightly offset to the right. In 2018 as in previous years, Royal Mail temporarily reintroduced the 'Common Poppy' design in many of its postal kiosks, marking the 'Remembrance Day'. Mainly observed by the countries members of the Commonwealth, the 'Remembrance Day' or 'Poppy Day' recalls the sacrifices of military and civilians during the First World War, and especially those who have died in the line of duty. This day of remembrance is held annually on November 11th, coinciding with the date of the end of the war, in 1918. 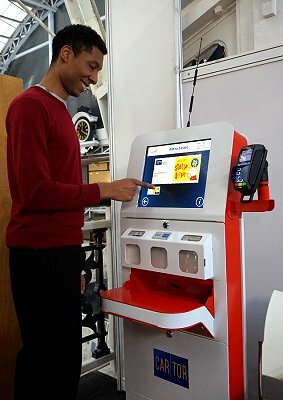 This design was available in some NCR - SSK postal kiosks (left strip) from October 23rd, in addition to the machine installed in the London postal museum (next section). Following the Royal Mail decision to not continue promoting the philatelic 'Post & Go' issues, in 2018 the design 'Common Poppy' was not used by the kiosks installed in military museums and the Royal Mail Enquiry Offices. 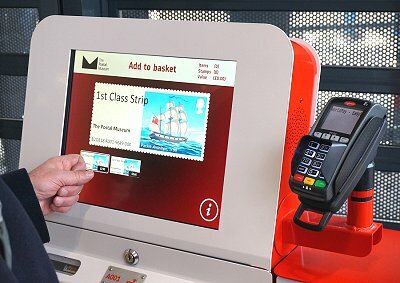 While most kiosks used rolls of labels left over from previous year printings, some of the NCR machines installed in post offices used rolls with the new 2018 reprinting (image below). 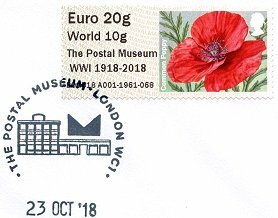 The 'Common Poppy' design was also available, from October 23rd, in the A001 - 'Post & Go +' kiosk of the London postal museum. in commemoration of the centenary of the Armistice that ended the First World War. The 'Common Poppy' design, with the 2015 reprinting, replaced the 'Royal Mail Heritage: Mail by Sea' series and was available until November 29th. The next day, it was also replaced by the 'Mail coach' design. 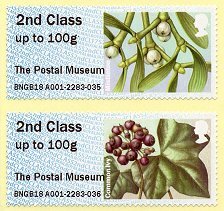 With the arrival of the Christmas holidays, the postal museum installed again the 'Winter Greenery' series of four designs, first launched in November 2014 (see article, also published in VARIABLE 35), in its philatelic kiosk. As in 2017 (see article and VARIABLE 47), the series was available from November 8th and until December 31st 2018, temporarily replacing the two 'Machin 1st Class' and 'Machin 2nd Class' definitive designs. 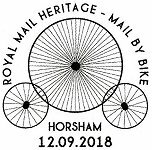 The latest change of designs of the year in the A001 philatelic kiosk was on Friday November 30th, when the 'Royal Mail Heritage: Mail by Bike' series was replaced by the 'Union flag' design. This definitive design had already been used temporarily by the kiosk from July 25th until September 12th 2017, on the occasion of the opening of the postal museum, but the stamps issued during that period included the ' The Postal Museum Official Opening ' special imprint (see article, also published in VARIABLE 46). Therefore, this design could be obtained, for the first time, with ' The Postal Museum ' permanent imprint.